How do you make voting cool? The folks at HeadCount know: wed it with something people are passionate about - music. Our team was stoked to make HeadCount a new website that rocks just as much as their audience! The new HeadCount.org is probably the coolest site we’ve ever built. 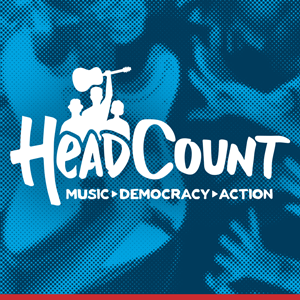 HeadCount is a non-partisan organization that works with musicians to promote participation in democracy. Given that they do the majority of their work at concerts and festivals, a uniquely energetic and lively space, their new website needed to reflect that energy, vibrance, and action. Inform their audience about voting rights and much needed voter info, like how and when to register, and which IDs are needed on election day. Recruit volunteers who, to take words right from HeadCount, “Register voters at concerts with HeadCount. Meet cool people, see great music, and change the world one voter at a time." Ensuring that both of HeadCount’s priorities were met without overwhelming visitors was key, alongside creating a voter info hub and volunteer hub that are visually appealing, engaging, and above all, easy to use. To emphasize HeadCount’s goals, once a visitor scrolls past the introductory portion of the page (pictured above), with the two main calls-to-action, “Register to Vote” and “Volunteer,” they are reminded again through energetic, eye-catching design and engaging content that HeadCount is a resource for voters, and a community of volunteers. We had a blast designing and developing HeadCount's new site, and are proud of the work our team put in. Want to see more? Make sure to check out HeadCount’s killer new site, and reach out if you, your campaign or organization is looking for a next-level Veracity custom website!